3 years have passed since the death of Sergei Reznikov, one of the founders of the biker movement in Kazakhstan. On June 13, 2007 on the Balkhash route it crashed on the motorcycle. Unfortunately, to save him failed. At the scene friends-bikers, a monument to Sergei, he built it from some parts of the motorcycle. – Together with Seryoga in the 90s we began to develop the biker movement in the country, — says the famous traveler. President of the Kazakhstan bike-club Dmitry Petrukhin. – The unusual guy. With a huge, kind heart. We called him”surgeon.” Because he could always find the right word for everyone and always helped people. At the same time I was a crazy biker. It ruined him. Very much he has done for motorcyclists across the country. He was one of the founders of the bike club, which I now lead. He was a good guy. We his remember and never forget. 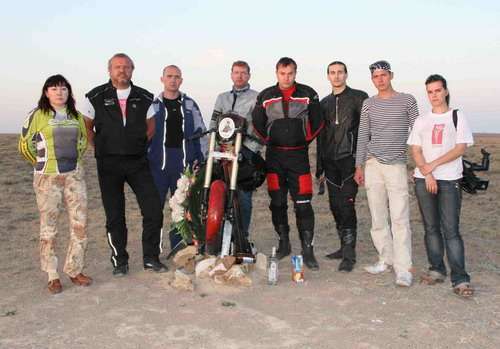 Team of motocross “With love to Astana!”On may 21, 2008 I stopped on the route in the place of accident where Sergey crashed, and honored his memory.